Welcome to ATF (Textiles) Ltd, the home of the UltiSeam technology. We specialise in the development, manufacture and supply of seam enhancement solutions, our technical research laboratories working closely with both manufacturers and retailers in order to ensure that our of products are the most advanced, effective and innovative on the market. 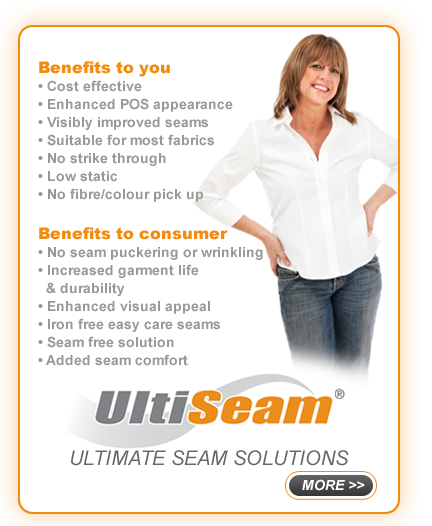 The result is the UltiSeam range of thermofusible seam enhancing products, providing cost effective solutions suitable for use in a diverse range of garments from high fashion and designer labels through to industrial workwear, school uniforms and corporate clothing. In partnership with a significant number of high street names our technology is helping to maximise their clothing’s shelf price through improved point of sale product appearance and the garment’s obvious lifestyle benefits to the consumer. Seam solutions for the garment & textiles industries.